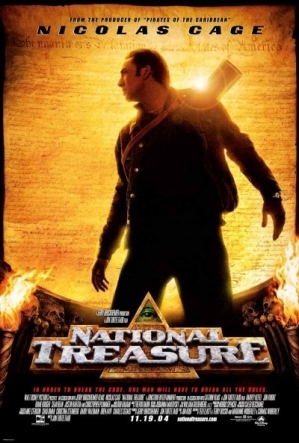 National Treasure is one of my favorite Nicholas Cage films ever! 1. What name did Ben use to introduce himself to Abigail? 2. What was the name of Ben's father? 3. Who was the president for whom Charles Carroll carried an urgent message? 4. What did Ben and his cohorts find aboard the Charlotte? 6. Ben's father always kept money between the pages of what book written by Ben Franklin? 7. Ben jumped from what ship into the Hudson River? 8. Ben told Ian the treasure was to be found beneath what church? 9. Ben and his father gave Ian a fake clue that led him to what? 10. Where did Ben find the special glasses for reading the hidden clues to the treasure?